St. Nicholas' Church, Church Road. On either side of the centre aisle at west end of nave. The northern one of two. Originally placed in the tower. It was moved near the companion plaque of those who served when it was erected. Plaque 74 inches high (total height 81 inches) x 50 inches wide. It is of plain design, with a dome at centre top. In the arch thus created is a plain cross, with the words "They died . . . . Country" below. The plaque is divided into three panels, on which the names are incised very lightly and painted black in a single column on each, using Roman capitals throughout. Below these, at the centre of the wide frame are the details of the erection with, on either side, the painted badges of (left) the Northumberland Fusiliers, and (right) that of the Durham Light Infantry, these being the regiments of the donors' sons. They died for God, King and Country. Erected by his Father and Mother / in affectionate memory / of their dear Son / Lieutenant J. Harry Edwards 14th D.L.I. / killed in action in France / January 7th 1917. 94 names, ranks and regiments. Mr. and Mrs. J.H. Edwards. 2. 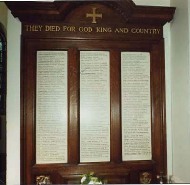 It would appear that there had been a plan for the memorial to have been an oak reredos, costing approx. £250, part of a scheme to include a new altar and panelling round the chancel. Whether this gift by Mr. and Mrs. Edwards precluded this is not clear. Morpeth Herald 15/04/1921 reports discussion of scheme for reredos, altar and panelling. Illustrated Chronicle 20/07/1918 carries photo following the unveiling. 6th Northumberland Fusiliers, April 26th 1915. 9th Northumberland Fusiliers, Nov.18th, 1915. 16th Northumberland Fusiliers, Dec.25th, 1915. 16th Battn., Canadian Scottish, Sept. 26th 1916. 2nd East Lancashires, Oct. 23rd 1916. 22nd Northumberland Fusiliers, Sept.12th 1916. 1st Tyneside Scottish, 20th N.F., July 1st 1916. Capt. Thomas Hall Waugh, M.C. 22nd Northumberland Fusiliers, June 6th 1917. 10th Northumberland Fusiliers, Nov.9th 1916. 16th Northumberland Fusiliers, July 12th 1917. 14th D.L.I. attached R.F.C. April 29th 1917. Lieut. John Halifax Feggetter, M.C. 12/13 Northumberland Fusiliers, Oct. 4th 1917. 1st Tyneside Scottish, 20th N.F., Oct.16th 1917. 9th Battn. Seaforth Highlanders, May 3rd 1918. 7th Battn. Royal Dublin Fusiliers, January 14th 1918. King's Shropshire Light Infantry, Nov.3rd, 1918. Captain Frank Douglas Balfour M.C. 1/15th London Regiment March 23rd 1918. Capt. James Cunliffe Leask, M.C. Lieut. Rex. T. Challoner, M.C. Pte. Robert Stanley Milburn, D.C.M. 1st Northumbrian Brigade, R.F.A., Oct. 2nd 1917. Pte. George William Denton, M.M. Sergt. Charles Thomas Gibson, M.M. Lieutenant J. Harry Edwards 14th D.L.I.